PennsylvAsia: Eunsuh Choi exhibition "Consciousness" at Pittsburgh Glass Center in Garfield, Feb 1 - Jun 16. 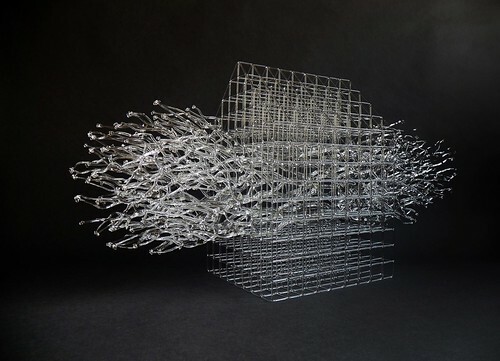 Eunsuh Choi exhibition "Consciousness" at Pittsburgh Glass Center in Garfield, Feb 1 - Jun 16. Eunsuh Choi's exhibition "Consciousness" opens at Garfield's Pittsburgh Glass Center (map) tomorrow and runs through June 16. The Pittsburgh Post-Gazette wrote a lengthy preview on the 30th. Her work is about aspiration and the symbolism that permeates her sculptures attests to that. Trees, for example, reach upward, as do ladders. Trees also symbolize human beings. The reaching limbs, as graceful as a ballerina's arms, end in small rounded buds at the ready to blossom into fulfillment. "Humans also kind of have seasons," Ms. Choi noted, cycling the relationship back. And, unlike ladders, she writes in an artist statement, "this is an object that lives and breathes, has the capability of growing and is equally capable of dying." The confining spaces of the boxes reflect "how I feel about living in a foreign country," Ms. Choi said. I’m interested in portraying the human aspiration in life with organic forms from the new perspective I had about myself within a foreign country. Originally from Korea, I relocated to the United States and my Korean heritage tends to make me ask about myself in terms of my direction as an artist and an individual especially after I came to the USA. What are my ambitions, how can I achieve these, and what is the personal significance? and the Pittsburgh Glass Center Facebook page has a lot of neat photos of, among other things, the pre-exhibition exhibition.